Brush oil over each chicken. Combine rub ingredients. Put half the mixture into a glass jar and set aside for another use. Sprinkle a tablespoon of the remaining mixture into the cavity of each chicken. Coat the chickens with the rest of the mixture and rub it into the skin. Tie the chicken legs together and secure the wings to the body. Leave chickens at room temperature for 30 minutes. 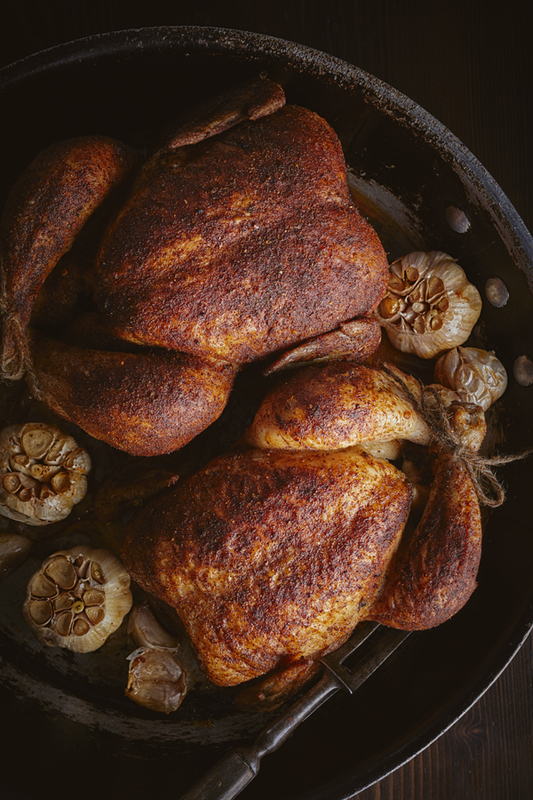 Place the chickens on a rack in a roasting pan and roast until a meat thermometer inserted into the chicken breast reads 180F (about 75-90 minutes). If the skin is browning too quickly, cover the chickens loosely with foil. Optional: Roast 4-5 garlic bulbs, tops removed, with chickens. Add the roasted garlic to mashed potatoes, or use it in any recipe calling for garlic (soups, stir frys, dips, stews etc). Leftover roasted garlic can be frozen.